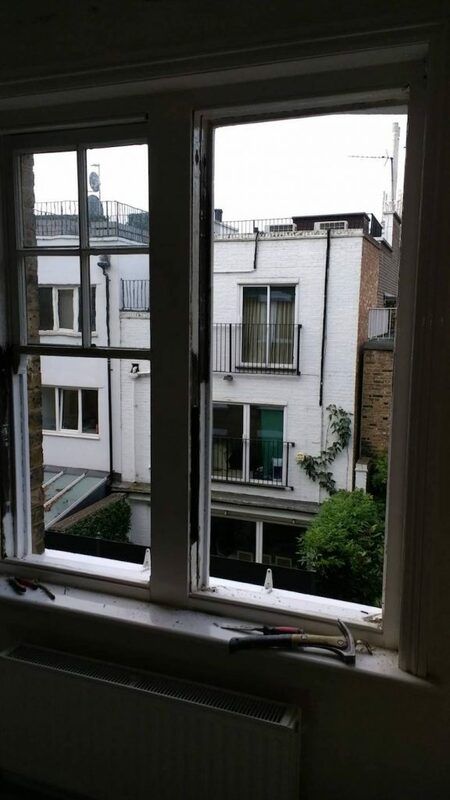 In this Kensington and Shepherd’s sash window repair and draught proofing case study our client required his six sash windows to be repaired and draught proofed. A couple of the sashes also had broken panes of glass which required re-glazing. This was a very straight forward job which took less than two full days to complete. The benefits of the draught proofing system on these sash windows was instant. The clients windows were in reasonable condition bar a couple of sash window repairs, the big issue was the cold, draughts, and dust coming through from outside. Once the draught proofing system was installed there was an instant transformation, even helping to dull down a bit of the noise from road side. This wasn’t a sash window double glazing job, if you would like to learn more about double glazing please follow the resource provided. To begin the process we put down dust sheets and then mark up all the windows. They might need some machining to close up gaps that have formed from decades of slow movement of the property. Sash windows are quite interesting with regards to movement on a property in that that they are the easiest way to note structural movement. Why is that you might be wondering? Well the construction of a sash window is made of two components mainly. The box frame and the sash. The box frame itself on construction is only pinned and glued together. It’s actually not all that strong, and most certainly isn’t structural. That’s why you have lintels above windows, both brick arch and internally, normally a wooden support. So when movement occurs, the frame will follow the property as the brickwork pressures the frame. This is perfectly normal, so if this is causing you concern, don’t let it. Almost every home in London has movement of some form or another and they are certainly not falling down. The sash by contrast is extremely strong and needs to be to carry the glass. 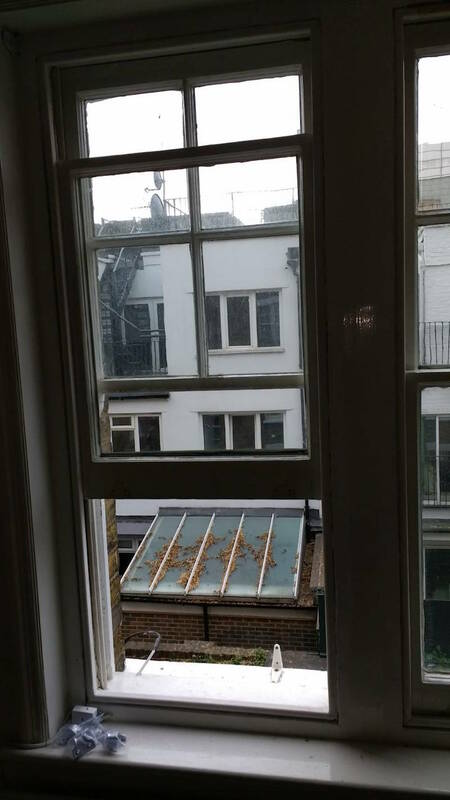 If a sash twisted then the glass would break and this would mean that almost all panes of glass in London would be broken by now and you would see random panes of glass, literally blowing, which they are not and do not. This is because of the structural strength of a sash. The sash is made with a mortice and tenon, which is so strong that when movement of the frame occurs, the sash simply sides down inside the frame, rather than following and twisting. That’s what causes your left to right gaps at the tops and bottoms of frames. Quite amazing isn’t it? Well when you see gaps left to right it can only mean one thing. The sash has just dropped or you have movement. The best solution to this is planning the sash to fit but I’d highly recommend a read on my wonky sash windows article that talks about problems that are so bad they need structural support or underpinning. 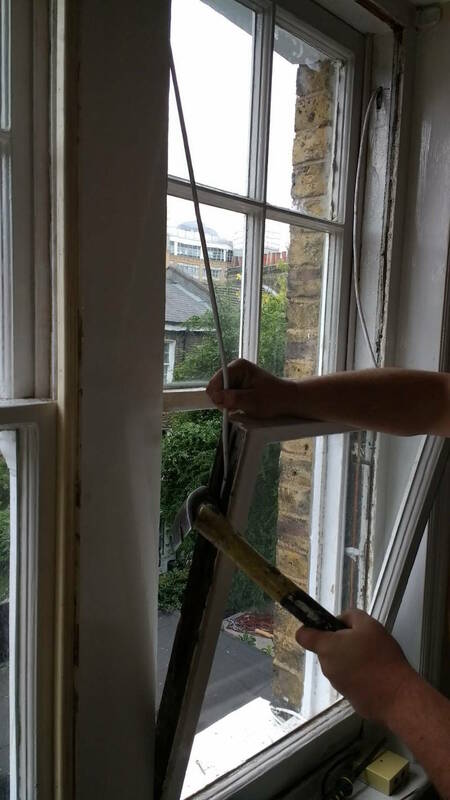 Back to sash window repair, overhaul and draught proofing! We mark up the sashes to machine and then the sash are removed from frame. With the sash removed the cords are then replaced. We check that the weight mechanism is equal so that the sash sits nicely at the head of the window rather than creeping down, creating that annoying gap most of us will of been unfortunate to see at some point. We then install a series of brush piles into the sashes, parting bead, and staff bead. With all the components ready we now can rebuild the window. Firstly top sashes are hung. Then parting bead is installed and then the lower sash is refitted. At this point we will check the meeting rail to ensure alignment. A sash window that has meeting rails aligned nicely looks so much nicer. It also helps improve the draught proofing because the rails are sat together parallel which gives a larger surface area for brush to meet. This is particularly important on windows with a slender meeting rail and all part of our quality sash window renovation services. If the window sits nicely, staff bead will be installed and furniture then added. The sash window repair is now complete and the draught proofing although completely invisible when the window is closed will be helping considerably. Please note that in this example we have not carried out sash window painting and decoration. You can easily see there is no visible difference between a sash window draught proofed, and one without. The brushes are doing their job of keeping your home more comfortable however. 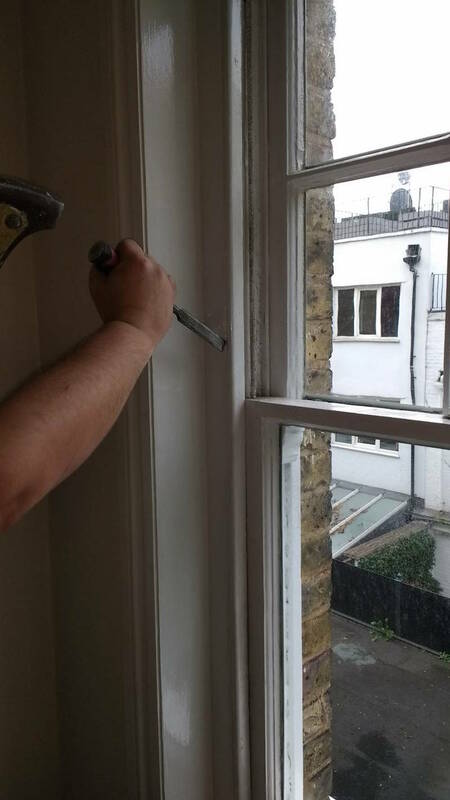 If you would like to learn more about draught proofing, or sash window repair in Kensington or Shepherds Bush then please do not hesitate to contact us.